UPDATED: Thu., March 15, 2018, 5:21 p.m.
BOISE – Joel Bruder wasn’t looking to build the Field of Dreams – just a place for fourth-seeded Gonzaga to carry out its walkthroughs and go through scouting reports before an 11:30 a.m. NCAA Tournament tipoff against 12th-seeded UNC Greensboro. An open space, a roll of blue tape and some creativity is all Bruder needed. Come Wednesday night, Bruder and his fellow architect, student manager Adam Davidoff, had transformed the ballroom of the Grove Hotel in Boise to a full-scale model of the McCarthey Athletic Center. Bruder and Davidoff used best estimations to measure out a 3-point arc, a full key and free-throw line and restricted area arc. Occasionally, the student managers like to add some extra touch and detail to their creations. 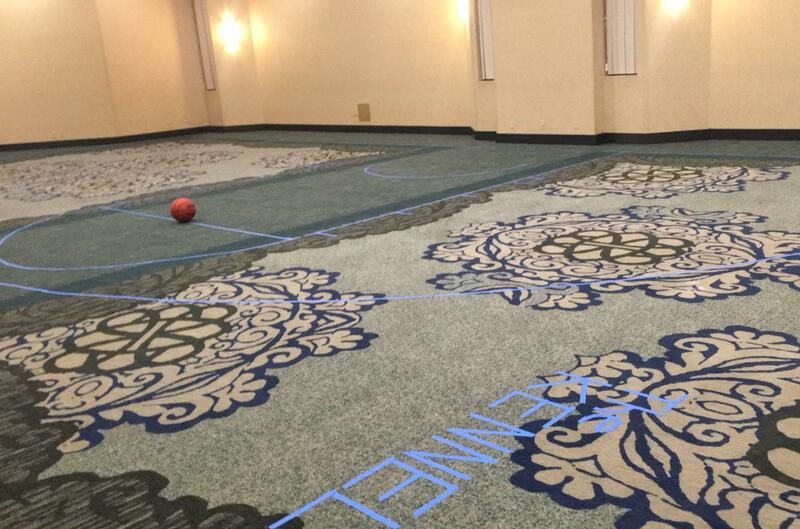 Bruder and Davidoff cut off strands of tape and spelled out “The Kennel,” attaching it to the same portion of the court where it appears in Spokane. “Added a little flair,” Bruder said. The Zags used the makeshift practice center Wednesday night for walkthroughs and again on Thursday morning. Hours after weaving through the blue tape and carpet of the team hotel, GU survived a scare from UNCG in front of a near-capacity crowd at Taco Bell Arena, pulling out a 68-64 win. So GU lives to see another day at the NCAA Tournament – and now so will the carpeted court at the Zags’ temporary residence in the Treasure Valley. Bruder also summed up Thursday’s game. Published: March 15, 2018, 3:29 p.m. Updated: March 15, 2018, 5:21 p.m.